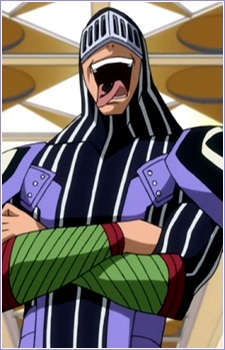 Bickslow is a 22 year-old member of the Fairy Tail Guild and, along with Freed Justine and Evergreen, makes up Laxus Dreyar's team Raijinshuu. His member's stamp is on his tongue. He is clearly identifiable by his "creepy" appearance, covered in black armor, face half concealed and constantly sticking out his tongue and laughing maniacally. Bickslow refers the dolls he controls with his magic as "babies." Bickslow seems to like souls, which fits in with his actual magic and figure eyes. Bickslow possesses Seidhr magic, which allows him to seal wandering souls into dolls or objects and manipulate them. This is shown by the five dolls that float around him. He fights by sending these dolls flying about rapidly and having them fire beams of energy from their mouths. Because of his type of magic, he is also able to see human souls. Bickslow, like Evergreen possess a special eye magic which allows him to turn anyone who looks into his eyes into dolls, allowing him to control their souls. Aside from his magic, Bickslow is relatively weak physically. With an abundance of magical characters, anime and special powers seem to go hand in hand. One of the most popular forms is seen in characters with powerful anime eyes - which grant them different kinds of powers. Check out some of the most renowned examples below. One of the many perks of being in a guild are the jobs. It's one of the main sources of income for the guild and its members. Jobs are likely to have different varieties and difficulties. Find out more about these jobs here!